"The government considers a family of four to be impoverished if they take in less than $22,000 a year. Based on that standard, and government projections of unemployment, it is estimated the poverty rate for kids in this country will soon hit 25 percent. 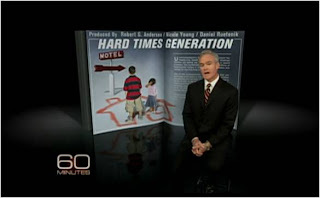 Those children would be the largest American generation to be raised in hard times since the Great Depression." It is heartbreaking what is happening in this country. If you have not seen this, please watch here. I did see this Sunday night. All I could think of was the Republican mantra that we need to cut, cut, andcut the budget, layoff, layoff, and more layoff government workers. Sadly, it will take another election cycle before people see enough damage to kick out the new Know Nothings tea party legislators, the Libertarian and GOP governors and Congresspersons who believe that we don't need government, that people should stand up on their own two feet, and that we should not tax the people to pay for anything (except in some cases the military). Sad, sad, sad. Locally, my State's (New Mexico) United Way got a million dollars more in donations this year because good people want to help provide relief. Why can't we do this with higher taxes from everybody who is earning money and a little more from the rich who can afford it even more? EU Refuses to Reveal Bank Data Transfers to U.S.